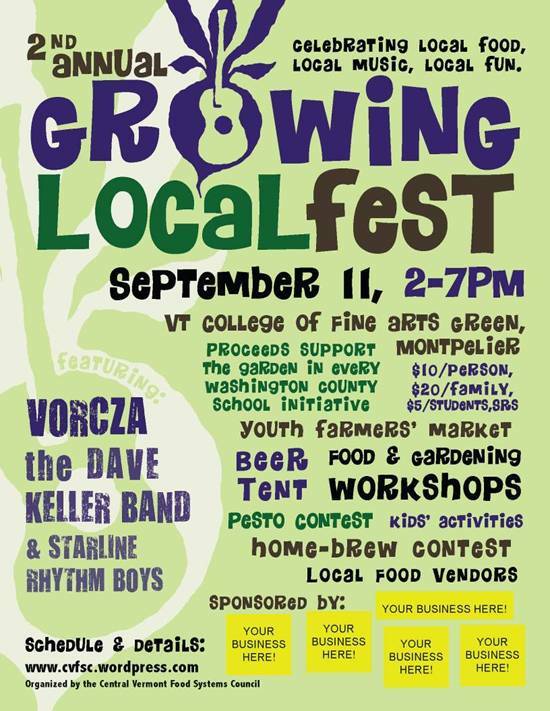 The 2nd Annual Growing Local Fest, a celebration of local food and culture, will be on Saturday, September 11, from 2-7pm at the Vermont College of Fine Arts Green in Montpelier. The event is being organized by the Central Vermont Food Systems Council (an outcome of enVision Montpelier). In addition to live music, food- and ag-related workshops, local food vendors, and a beer tent, there will also be a HOME BREW CONTEST, a PESTO CONTEST, and a YOUTH FARMERS’ MARKET! For the most up-to-date details and schedule of the event, go to www.cvfsc.wordpress.com.